1. Press loves statistics and rankings. Use the rankings as an angle to communicate your destination’s core brand values and key messages. The ICCA rankings provide an opportunity for you to generate a high free profile for your organisation and your destination in the media. In order to be successful you have to realise that a news fact alone is usually not interesting enough for press to publish your article. The releases that get the most coverage are the ones that create an interesting and newsworthy story around a news fact. This story should answer WHY and HOW you got the current position in the rankings: Have you launched a new ambassador programme or a new direct marketing campaign? See also: “Remember your three Ps. Point (or Purpose), People, and Pictures”. Plug in your good ICCA ranking in al PR messages: Repetition works! If you are not a convention bureau: Note that media is paying attention to your city when the ICCA and UIA rankings are published, so hotels and venues could also take advantage of this momentum. Get creative! If you are a smaller destination or you have dropped the regular ICCA rankings, you have to get creative: Maybe you have hosted fewer but bigger meetings and you have hosted more participants? Did you organise more meetings in a specific subject area? Are you the second or third meetings city in your country? Are you amongst the 10 biggest risers? You can use the ICCA Destination Comparison Tool to make tailored rankings based for example on specific subject matters, meetings with at least 500 participants, or use the ranking based on estimated total number of partcipants instead of number of meetings if your destination ranks higher in this ranking. If you have dropped in the rankings or are not proactively going out with a release, we would advise you to prepare your story behind the figures. The rankings draw a lot of media attention and you better be prepared when journalists ask you why your destination has dropped in the rankings! 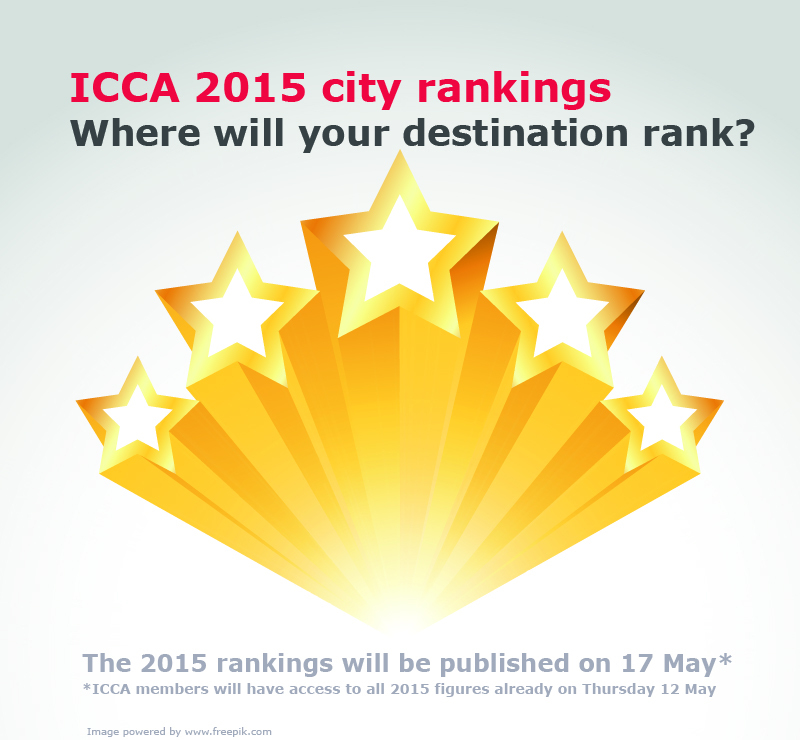 Educate journalists about what the ICCA rankings represent and what is not included. Remember: the Association Database only includes association meetings which take place regularly, rotate between at least 3 different countries and have at least 50 participants. Association meetings are long term business, so also look at what is currently in the order books to create a positive story. Collect your own statistics: Maybe your performance has increased in the national, governmental or corporate market segment? ICCA has partnered with our friends (and ICCA Congress speakers) Greg Clark and Tim Moonen at The Business of Cities to share with ICCA members their comprehensive analysis of the most useful and insightful global cities rankings. This additional city ranking resource demonstrates that there are numerous alternative approaches to the analysis of competitive position and performance! Check out dozens of robust and relevant indexes for ICCA members to explore. Make sure you collect data on all meetings taking place in your destination and report it to ICCA, so all your meetings are included in the statistics. Use your destination’s ranking for advocacy purposes to your key stakeholders like your local community or government for which you rely on for funding. Team up with the association in their advocacy efforts and highlight the value of the meeting beyond the touristic impact only: communicate the economic and societal benefit of the meeting for your destination. The ICCA rankings help meeting planners to decide where to hold their events, as they are scrutinising ICCA data to work out which destinations are increasing in popularity and where their peers are meeting. Consider placing a sponsored hyperlink in the public version of the 2015 statistics report which ICCA is sending to over 6,000 associations in mid-June. For more information on this opportunity contact Sebastian Sew at: sebastian.s@iccaworld.org. For the ICCA Best PR Award we are always on the lookout for excellent examples of PR by ICCA members. Who know, your story might be included as a finalist in the ICCA PR Award, giving you lots of additional exposure? BONUS TIP: Use the ICCA PR Kit to distribute your news. The ICCA PR Kit provides all members with some free, simple and effective tools to increase your PR profile. We are looking forward to seeing your media coverage!